This custom diamond wedding ring has a lot of history – let Scott’s Custom Jewelers help you tell your story! And Sue is a very sentimental person. Each piece of jewelry she’s collected has a story. But wearing 30+ years of rings can be a little awkward, to say the least. So she came to Scott’s Custom Jewelers to see what kind of “jewelry magic” he could do with her collection. There was the diamond band made up of stones from her original, cluster style engagement ring. Then years later, Dave bought her a “proper” engagement ring with a beautiful cushion cut shaped diamond. And later, he “juiced up” the solitaire ring with a diamond guard. All of the gems were gorgeous, but the styles had changedï»¿. So, Scott sat down with them and found a design that Sue liked. She was drawn toward vintage style rings – very much like the one her grandmother had worn. Styles with curves and bead work and a lot of diamonds. That’s a good thing, because she had a lot of diamonds to work with! By surrounding her cushion cut diamond with the gems from her original engagement ring, Sue was able to create an amazing ring that truly told her story. And by setting them into 14k white gold, the gems blended together, and looked like one HUGE diamond (definitely a plus!). 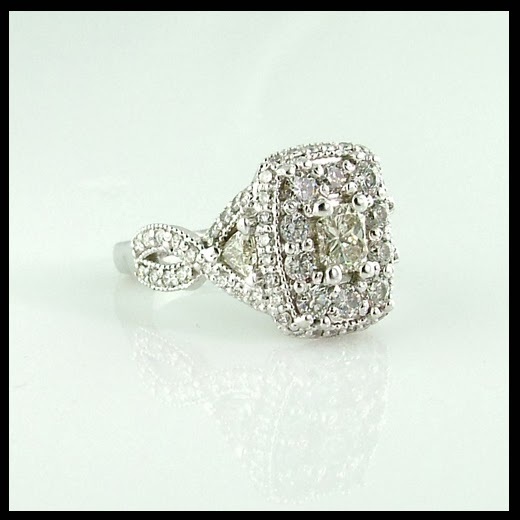 The sides of the ring also contained trillion cut diamonds and other gems, woven together in that vintage design. Scott first designed the ring using CAD technology, and sent her photos that gave her a great idea of what the finished piece would look like. After some minor adjustments, Scott used a 3D printer (we invested in this awesome piece of equipment to not only cast our designs, but to make real-sized models so that our customer’s could actually see the piece before we made it!) and Sue got to try on her ring before we casted it. The model was great, because we then could see how high the ring was on her finger – and that was too high! But, no harm, no foul, because we simply adjusted the design and were good to go. And since we caught the change before we started, no expensive adjustments either. When Sue saw her finished piece – she gasped! “It’s exactly what I expected, but with so much more sparkle!” she said. That’s what we aim for here. Sparkle. Stop by one of our two Scott’s Custom Jewelers locations – Akron and Columbus, Ohio, and let us help make something sparkle for you.